One of the hardest things about long air flights is organizing your carryon luggage. Any flight can be challenging, but it seems the longer the flight, the more you need. Traveling with kids adds to the chaos. To minimize the chaos, and increase the odds that you won’t lose your mind while flying, use ziploc bags to organize everything you need! Pack a change of clothes for the kids. In a one-gallon bag, pack a change of underwear, shirt and lightweight pants for each of the kids (one bag per child). If they have an “accident” or spill their drink, you have ready access to a change of clothes AND a handy place to pack the dirty items. Make a freshen up bag. Include toothbrushes, travel size toothpaste, face washing wipes, and travel size deodorant. 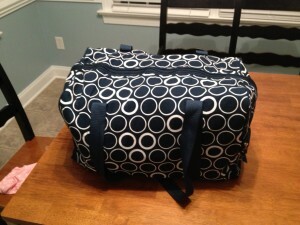 Most travel bathroom bags are bulky and include more than is ESSENTIAL for air travel. 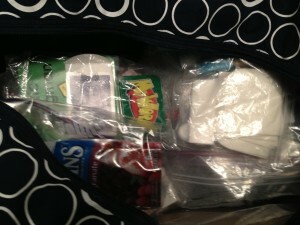 Simplifying by packing the basics in a ziploc bag means less to juggle during a long flight. Provide toys. 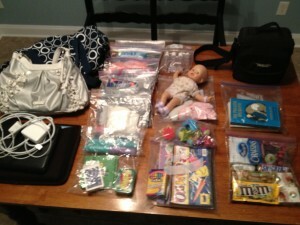 Pack games, coloring book and crayons, Wikki Stix, dolls and superheroes each in their own bags as space allows. When the kids get restless, pull out a new bag of items to play with without the risk of dumping everything. Include a bag of essential papers. If you don’t organize your reservations on your smartphone, keep all your reservations in one place. Sliding a ziploc bag in and out of a carryon pouch is easier than cramming all the papers in and hoping not to lose anything. It also provides a handy place to store receipts throughout the trip. Make a fun snack bag. We pack fruit chews, gum, individual servings of crackers and pretzels in a gallon size bag for easy access throughout the trip. Here’s everything packed in bags. bag are placed at the bottom because they’re least likely to be used. easy accessibility on the plane. for easy access at the TSA checkpoints. We actually reuse our ziploc bags trip after trip. They last for years and are far cheaper than luggage organizers. They are waterproof (or very close to it), so that helps too. Because everything is self-contained, I can quickly find what I need without worrying that I might lose something. Special note: Now that my kids are older, they each pack their own carryon with their own bags: one for a change of clothes, one for snacks, and one for each type of toy/activity they want to take. My bag keeps getting lighter while they learn to travel light and efficiently. The ziplocs for organization are great. One other suggestion, especially for parents of really little ones – a change of shirt for you. I used to just pack one of my husband’s, and if baby puked or poop exploded on either of us we had a shirt to change into. I was remembering this the other day when my darling unexpectedly vomited on me during church! I wore a sopping wet shirt the rest of the meeting, and have vowed to have ’emergency clothes’ for each member of the family in the van. Ziplocks are the BEST! I also use them for what ever goes in the bathroom at the hotel. I keep a wet and dry bag. Anything that went in the shower or sing goes in the wet bag and all else goes in the dry one. Such great tips. I am taking my first flight with kids next month and have been really stressing about the carry on! Thanks for the info! Theresa, I hope you enjoy your first trip with the kids. No matter what, stay calm! Your attitude is the greatest influence on the trip. You can’t change airlines, delays, seating assignments (well, sometimes), or the security line check. You can take it all in stride and everyone around you will benefit. Give yourself plenty of time and arrive early! I hate messy carry on luggage, but I haven’t found a successful way to keep it clean. I’ll have to try the ziplock method. Thanks for linking up today! These are great ideas! I use some of them already–but I never have packed the extra clothes in plastic bags. I definitely will from now on. 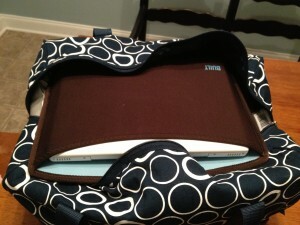 I don’t usually travel with my laptop, so when I did last week I accidentally put it on the BOTTOM of my carry-on. Ugh–I had to pretty much unpack the whole thing to get through security. I’m sure you were a favorite in the security line…. but hey! Now you have a great lead-in for a blog post. Right? Karen as a “seasoned traveler” I feel like I know it all 😉 But this is fantastic. Last year I flew with the kids and had all of their new toys in one bag – i think as you suggest I will divide it into smaller bags to maximize the surprise and joy. But I love all the other things in ziplocs too. If I’m not too manic I will snap a pic of my carry on in ziplocs before I go! If you remember to get that pic, be sure to post it on the facebook wall!!! I had a hard time figuring out how to get a great pic — the glare off the bags was tough. We’ve been using some of our bags since my husband traveled to Haiti on a mission trip after the earthquake. They’ve been on at least ten trips since then! They really are durable AND cheap!!! If I happen to lose one, I don’t feel bad, that’s for sure. 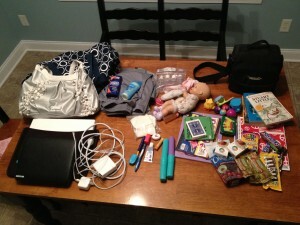 It’s funny how my carry ons have changed since I became a mommy! I went from Vogue and Evian spray mists to diapers, baby clothes, and whatever I can throw in for me. I used to walk off the plane looking like a rockstar now I walk off looking like a zombie. Oh how times have changed! The toy bit works amazingly too! My daughter can swap out toys as often as she wants (within reason — not during the climactic close of the fascinating movies. LOL). She just packs up one and then requests the next. Like a library in a carryon bag! We used to pack my kids clothes for summer camp in ziplocs, so they could just grab one and head to the showers. Silly me, I never thought to do that for travel!